Book Description: Violet Ambrose is grappling with two major issues: Jay Heaton and her morbid secret ability. While the sixteen-year-old is confused by her new feelings for her best friend since childhood, she is more disturbed by her "power" to sense dead bodies—or at least those that have been murdered. Since she was a little girl, she has felt the echoes the dead leave behind in the world . . . and the imprints that attach to their killers. My Review: I always enjoy reading stories that take their time, weaving in plot elements, creating credible characters and conflicts, making their world of words a place I want to remain in until the very end. 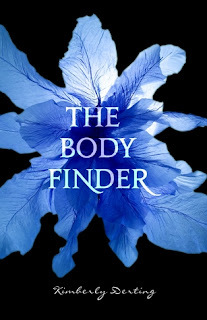 THE BODY FINDER is an entertaining, fully developed novel with a supernatural twist and a boy-next-door any girl would love to call her guy. Violet Ambrose is a junior in high school. She has a childhood best friend named Jay and a strange ability to hear the "echoes" of the dead. Young girls begin to disappear too close to home and Ambrose discovers the body of one. While she tries to come to grips with her changing feelings towards Jay, she must also deal with finding out the madman killing girls--before it's too late. This story drew me in from page one as Violet walks through the forest with her dad. She is only eight and discovers her first dead human body. From then on I was intrigued by the storyline, Violet's world, the fully realized characters, the murder mystery, and the growing attraction between best friends. Derting has written a suspenseful and entertaining novel and I recommended it. "When she saw him there, behind the wheel, she stopped walking, trying not to look so thankful as she blinked away the tears. She heard the door opening, and before she could catch her gratified breath the driver was out of the car and she was in his arms. She wanted to breathe, to inhale his lethally musky scent, but she couldn't find the air around her. She was suffocated in the strength, the warmth, of him. Time seemed irrelevant at that point; it could have been seconds or hours. It didn't matter. She didn't even realize she'd been crying again until he pulled away and leaned down to kiss her wet cheek." For Fans Of: Contemporary, paranormal, fantasy YA. I keep hearing about this book everywhere I go. Looks like I'm going to have to check it out! Thanks for the recommendation. Great review! I've wanted to read this one for a while now and after reading your review I'm that much more excited, thanks for the rec!